Mary Ellen Bork is a free-lance writer and lecturer on issues affecting Catholic life and culture. She is a graduate of Manhattanville College with a B.A. in Philosophy, Siena College with an M.A. in English Literature, and Catholic University with an M.A. in Theology. She taught religion for many years as a Sacred Heart nun. She serves on the Advisory Board of the School of Philosophy, Catholic University of America and Christendom College. She serves on the editorial board of the magazine Voices. She is on the Susan B. Anthony List, and the Chesterton Review. For several years she has facilitated groups studying Pope John Paul II’s theology of the body. She is a member of the Catholic Commission on Intellectual and Cultural Affairs, and Past-president of the Downtown Washington Serra Club. She is past president and program chairman of the Thomas More Society. She is doing research on Catholic leaders during the English Reformation and sixteenth century Catholic religious leaders. She received the St. Paul Woman of the Year award in 1991 from the Daughters of St. Paul, and the Brent Society Award in 1992. In 1995 she received an Honorary Degree from Franciscan University in Steubenville, Ohio. She was a member of the Presidential Delegation to the Twenty-fifth Anniversary of Pope John Paul II in Rome in 2003. She also attended the Beatification of Mother Teresa of Calcutta. Her articles appear in the National Catholic Register, the Washington Times, Voices, and The New Criterion. 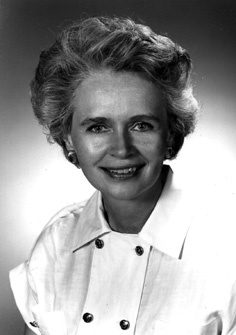 Mrs. Bork, wife of the late Judge Robert Bork, lives in McLean, Virginia.